Many students, engineers, scientists and researchers have benefited from the practical, programming-oriented style of the previous editions of Programming the Finite Element Method, learning how to develop computer programs to solve specific engineering problems using the finite element method. This new fifth edition offers timely revisions that include programs and subroutine libraries fully updated to Fortran 2003, which are freely available online, and provides updated material on advances in parallel computing, thermal stress analysis, plasticity return algorithms, convection boundary conditions, and interfaces to third party tools such as ParaView, METIS and ARPACK. As in the previous editions, a wide variety of problem solving capabilities are presented including structural analysis, elasticity and plasticity, construction processes in geomechanics, uncoupled and coupled steady and transient fluid flow and linear and nonlinear solid dynamics. 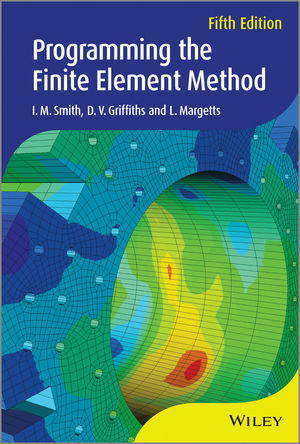 Programming the Finite Element Method, Fifth Edition is an ideal textbook for undergraduate and postgraduate students in civil and mechanical engineering, applied mathematics and numerical analysis, and is also a comprehensive reference for researchers and practitioners. Professor Ian Smith is Professor Emeritus at the University of Manchester. He is a Fellow of Royal Academy of Engineering and has 200 published research papers. He has authored 5 books, the latest Boundary Element Method with Programming (Springer 2008). Professor Vaughn Griffiths is Professor of Civil Engineering, Division of Engineering at the Colorado School of Mines. His research focuses on oil resource geomechanics, probabilistic geotechnics, soil mechanics and foundation engineering, finite element software development. Dr Lee Margetts is Head of Synthetic Environments at the University of Manchester Aerospace Research Institute. Dr Margetts' main areas of expertise are in structural mechanics, geotechnical engineering, high performance computing and tomographic imaging. His main research activities concern investigating how real materials behave (both organic and inorganic) and how this can be simulated using computers.